A child needs their own personal space as well as adults in the home. Children need a place that they can call their own, owning a playhouse ensures they have one. Playhouses give a child a space that is completely theirs, that they can go when they need quiet time or want to enter into their own little world. Here are 2 playhouses that are perfect gifts for kids. The Exit Loft 300 wooden playhouse is a beautifully designed playhouse that stands on legs and is equipped with a ladder and slide to provide endless fun. It is very easy to put together due to its prefabricated parts, there is also a manual included. The sleek Scandinavian designed Exit Loft 300 has beautiful white window frames with a waterproof roof. This playhouse is weather-resistant because it is produced from FSC® certified cedar wood which is resistant to weather influences and wood rot. The Loft 300 comes in a natural, red or green colour. This playhouse is definitely an outdoor toy every child should have in their garden.The dimensions for this playhouse are as follows:- Length – 268 cm, Height – 215 cm, Width – 190 cm, Platform height – 60cm and Length of the slide – 120 cm. The Exit Crooky 750 wooden playhouse is playful and imaginative playhouse that is perfect for young children. It requires assembly but there is a manual included to make it an easy task. The high, cool Crooky 750 is equipped with a slide a sandbox for kids to enjoy playing. It stands on legs, has a veranda, balustrade and terrace. This beautifully designed wooden playhouse includes slanted windows, a slanted roof and a slanted door. The Exit Crooky 750 playhouse is weather-resistant, due to being made with FSC® certified cedar wood which is resistant to wood rot and weather conditions such as rain. The Crooky 750 comes in a grey-beige colour with a green slide. This playhouse will definitely provide endless fun and memories for children.The dimensions for this playhouse are as follows:- Length – 444 cm, Height – 281 cm, Width – 183 cm, Platform height – 120 cm and Length of the slide – 228 cm. Note they are no ground anchors included. There are lots of benefits to a child having their own playhouse. To learn more about our playhouses visit us online today or call us on 021-496-5132. A playhouse is one of the greatest joys of someone’s childhood. Playhouses give children hours of fun through imagination and roleplay. Not all playhouses for kids are the same though. There is a wide array of designs, sizes, features, and prices of playhouses. Here is our fantastic selection of the best outdoor playhouses. There are 8 playhouses in our EXIT crooky playhouse range. There are 8 playhouses in our EXIT aksent playhouse range. 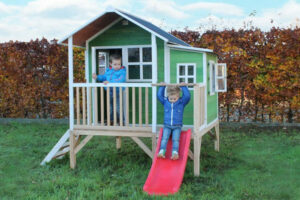 There are also 8 playhouses in our EXIT loft playhouse range. There are 2 playhouses in our EXIT beach playhouse range. Our fantastic selection of playhouses provides them with a space to have fun and widen their imagination. For more information regarding our EXIT playhouses call us today on 021-496-5132 or visit us online today. Exit playhouses are great toys that will keep children occupied during these long summer months. They need little maintenance and have the capability of providing hours of high-quality entertainment to the children that play in them. With the explosion of technology use amongst younger generations, it has never been more important for children to take some time outside to play and just be kids. Taking time away from a screen to go outside and play in a playhouse has lots of benefits. 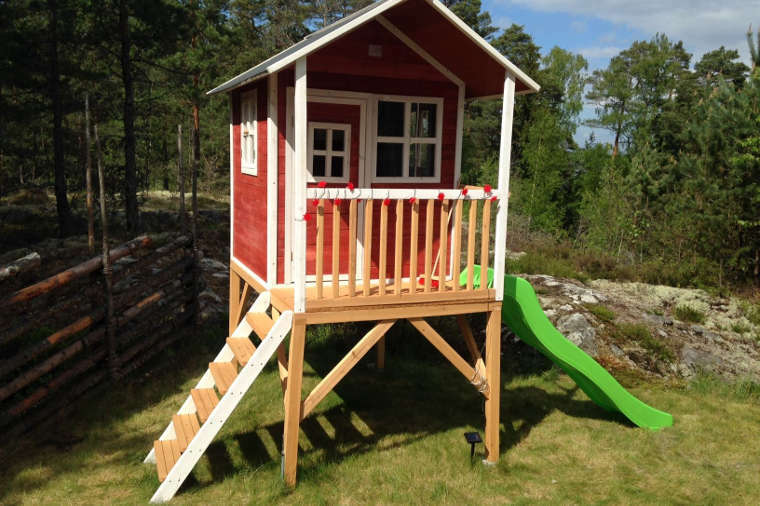 Here are 4 more reasons you should have an Exit playhouse in your garden. As children grow, they will need more physical activity to boost their development. If your child doesn’t have a place to play, they may lose interest in it and prefer sitting down on the sofa, eating and watching TV. Eventually, this will lead to obesity. They will gain weight due to lack of physical activity and bad eating patterns. All food has calories so if they are not doing the necessary exercise to burn those calories then they are going to continue putting on excess weight, putting stress/strain on their body/organs and ultimately getting extremely unhealthy. After using a lot of energy, kids will have to recharge and sleep. They need a lot of sleep to recuperate the lost energy spent from playing in their playhouse. Most children are quite hard to get to bed, especially if they are watching tv, playing with technology or engrossed in video games. Playing outside reduces the likelihood of kids developing a habit of going to sleep late at night, which is unhealthy. Playing all day in a playhouse would result in them having a sound, continuous and better sleep which would help improve their mental and physical development. Playhouses give children more opportunities to play but more importantly be a child. Playhouses create that sense of magic and imagination amongst children. The memories created in such a special place last a lifetime. So it’s important to provide the best possible space for these memories to blossom. Playhouses for children provide an opportunity for their budding imaginations to literally take off. Play that is imaginative in nature is an important factor when it comes to cognitive development. Playhouses are an excellent tool to teach kids about responsibility. They have to learn to play responsibly and look out for others, while also following the rules you have made for the play areas. This will help them for the future when they have to abide by more serious rules like school, work and the law. If you would like to learn more about playhouses then call us today on 021-496-5132 or visit us online today. As well as adults, kids need to have their own personal space. Children need a place where they can develop a sense of independence and escape to just be free and by themselves. Exit playhouses can be the perfect solution for that. Every parent wants their child to be happy and getting a playhouse for them might be one of the best things you can do to make them feel happy. They provide children with a safe and fun play area that doesn’t require constant parent supervision. All you need for one of these is a small area in your backyard for the playhouse. It is a small investment of money that has lots of worthwhile benefits for your kids. 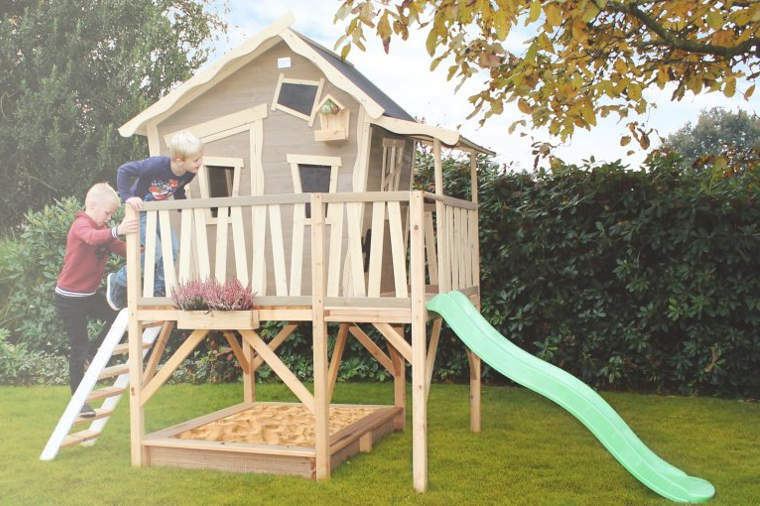 Here are 5 reasons you should own an exit playhouse in your garden. Children also need exercise like adults. Playing outside in a playhouse will increase the amount of time they will move their bodies around being active and exerting energy. Exercise keeps relieves stress, promotes healthy digestion as well as having them feeling better psychologically. Exercise is the best way to keeps healthy. Kids need a lot of exercises, especially as they are still developing mentally and physically. Engaging in an outdoor activity like playing in a playhouse, is a great way to keep them healthy and active. Playing involves a lot of social activity, gives children the opportunity to meet new people, make new friends and develop their social skills. The friendships and relationships that are formed in a playing environment are great for their overall social development. Whether this is with a friend, a cousin or a next-door neighbour, this will lay the groundwork for creating happy and healthy relationships in the future when they grow up. Getting access to good quality fresh air has many health benefits. If your child is playing in a playhouse out in the back garden rather than inside then they are much more likely to run in and out of the house, therefore getting much needed fresh air. Fresh air relaxes your body and mind, cleans your lungs and energises your whole body and the brain. Getting fresh air every day will help your child feel better and be healthier. When children are playing, they will be using a lot of energy from their body. If your child is not doing some sort of physical activity regularly then their body and immune system will become weaker. This will result in a lesser resistance from sickness and diseases. They will be accustomed to getting sick very easily from having a weak immune system. By setting up a playhouse you will encourage more physical activity and ultimately build up their immune system ensuring a healthier child. All the of the countless hours of playing in a playhouse brings lots of different movements and coordination patterns. These include things like climbing, crawling, sliding and jumping which will do wonders for them physically. The muscles in their legs, hands, and body will get stronger and healthier which will aid in overall bone health and growth. Playhouses are something every child should have in their back garden. They will be instrumental in their upbringing and provide a great place for countless hours of fun, exercise, and many more of the benefits outlined above. You’ll also give yourself more quiet time to yourself. Visit us online today and check out our fantastic range of Exit Playhouses. Exit Playhouses are toys which provide a great avenue for entertainment to children in their home garden. They are a great big stand-alone toy but what can make them even better is the addition of some cool accessories. EXIT playhouse accessories are high-quality pieces of materials which last for a long period allowing children to enjoy them on their playhouse for a long time. There is a great range of accessories available to give your playhouse that personalised touch and feel. From birdhouses to chalkboards to flower pots to decoration kits we have all the products you need to make your playhouse your own. Here is our full range of EXIT playhouse accessories. The EXIT anchoring set for play equipment and playhouses consists of four-anchors and a fastening set. This set is rust free and allows a playhouse to be easily anchored. The anchoring set ensures that the playhouses and play equipment are always standing firmly on the ground. Even when children are having the wild fun, it can withstand the force placed on it. The EXIT birdhouse is a great accessory for all animal lovers. Birds can seek shelter in it and you can sprinkle bird feed for them to ensure they never go hungry. Not only will you add a cool feature to your playhouse but you will also make birds happy. Dimensions of the birdhouse- Height 26cm, Width 18cm, Depth 11 cm and Weight 0.5 kg. 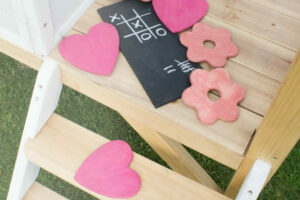 The EXIT decoration kit consists of a chalkboard, three wooden flowers and three wooden hearts. It is easy to mount to the playhouse using a screw set which is also included. Children can use their creativity and decorate the chalkboard to their liking. This is a great set to let kids express themselves in different ways. The EXIT floorboard is suitable for the extension of the Loft 150 wooden playhouse and is supported by a wooden frame. This floorboard is easy to assemble, weather resistant and is manufactured from cedar wood. The wooden frame is included. The EXIT floorboards are suitable for the Loft 100 and Crooky 100 playhouses. A wooden frame supports the two floorboards. These floorboards are easy to assemble, weather resistant and are manufactured from cedar wood. The wooden frames are included. The EXIT flora flower boxes are wonderful accessories for people who are interested in flowers and plants. With these boxes, you can plant all types of flowers or plants in them. The set contains 3 wooden flower boxes. The EXIT parasol ø120cm is perfect for protecting children against the sun during very warm and sunny days. Some tables have a hole in the middle so you can easily secure this parasol into it. The parasol is black in colour. The EXIT picnic set consists of a beautiful wooden table with four children stools. The EXIT parasol can easily be inserted into the middle of the table. That way, you can play and sit outdoors even during very warm days. The dimensions of this picnic set are:- Wooden table (65x30x45 cm) and 4 wooden stools (30x20x25 cm). The EXIT picnic set consists of a beautiful wooden table with two children stools. The EXIT parasol can easily be inserted into the middle of the table. That way, you can play and sit outdoors even during very warm days. The dimensions of this picnic set are:- Wooden table (40x30x45 cm) and 2 wooden stools (30x20x25 cm). The EXIT safari chalkboard is a cool weather resistant feature that children can add to their playhouse to express themselves in different ways. Children can use their creativity to decorate the chalkboard whatever way they want. This chalkboard is easy to mount to any playhouse. Dimensions for the chalkboard are as follows:- Height 39 cm, Width 36 cm, Depth 1 cm and Weight 3 kg. The EXIT sandpit cover fits on the sandboxes of the Loft and Crooky playhouses. This accessory only covers series 500, 550, 700 and 750 playhouses. The cover keeps the sandbox clean and keeps animals from using it. Pegs are included so that it will remain in place under all weather conditions. Ground tarp and anchoring set included as well. These playhouse accessories are a great additional feature to add to any playhouse. By adding different accessories, you add fun to your playhouse and inspire your children to play actively and imaginatively. To find out more about our playhouses accessories or playhouses then call us on 021-496-5132 or visit us online today.